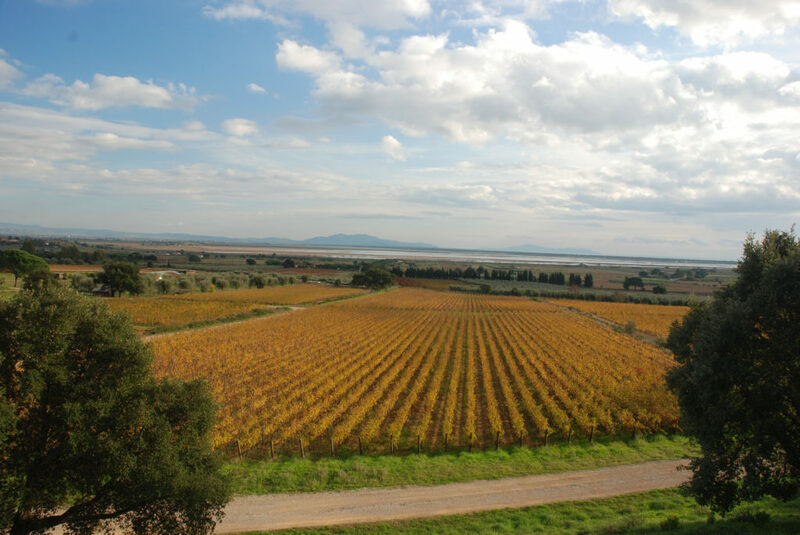 In the hilly amphitheater of Tuscany’s Maremma region, above an ancient coastal lake called Prelius, a vineyard organically farmed by the Stianti Mascheroni family flourishes. This vineyard, also called Prelius, is the first venture outside of Chianti Classico for the Stianti Mascheroni family, leaders in Tuscany’s organic viticultural movement. The 21-hectare (52-acre) estate, purchased in 2007, is located in the municipality of Castiglione della Pescaia in the Grosseto region and is neighbored by the vineyards of Antinori and Bellavista. Grosseto lies in the central part of the Maremma region, south of Bolgheri and north of Lazio, in the westernmost part of Tuscany. A plain carved by centuries of rivers and floods, Maremma is bordered by the coastline of the Tyrrhenian Sea, which is part of the Mediterranean Sea. 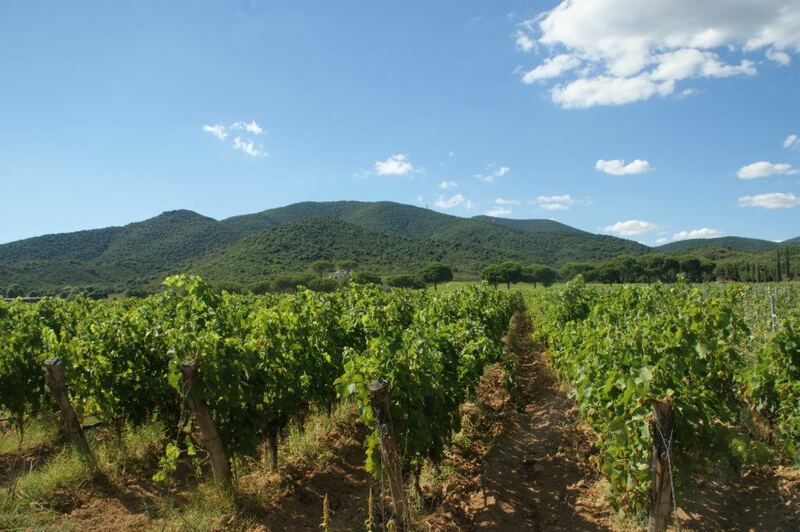 To the east is a low range of maritime hills covered with Mediterranean “macchia,” a mix of plants and trees that is often credited for lending wines of the area a distinctive flavor. 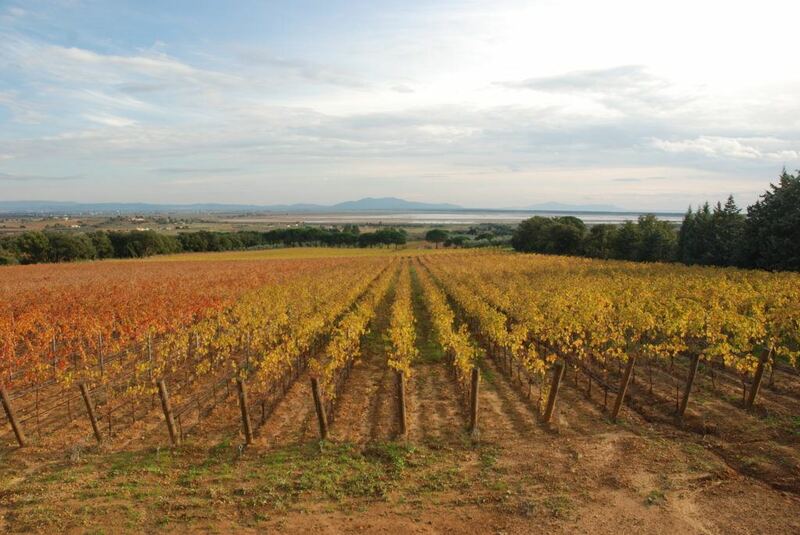 Benefiting from the proximity to the sea, the Maremma has mild winters that rarely experience temperatures below freezing. Summer temperatures are relatively high during the day, but cool off in the evening due to breezes that flow from the sea to the hills. These breezes also help to keep humidity at bay. Rainfall primarily occurs in late autumn, winter and early spring. The Stianti Mascheroni family is committed to organic farming at the Prelius estate. These efforts are aided by both nature and man. Mother Nature does her part by providing continual breezes throughout the day and night, which keep humidity at bay, preventing fungus and mold. Insect pests are controlled by an innovative natural technique referred to as sexual confusion, which is accomplished by releasing pheromones to confuse the males, who then cannot locate females and reproduce. And, all fertilization is achieved with organic manure. A mere five kilometers (just over three miles) from the Tyrrhenian Sea, the Prelius vineyard sits on a cornice under the historic Castellaccio di Prile, one of the region’s early protective fortresses. The vineyard elevation ranges from 37 to 52 meters (120 to 170 feet) with a slope just shy of 5 percent. The 12 hectares (29.7 acres) of vines on the estate were planted between 2001 and 2005 to Cabernet Sauvignon (6.35 hectares or 15.7 acres), Sangiovese (2 hectares or 5 acres), Vermentino (2.1 hectares or 5.1 acres), Merlot (1.05 hectares or 2.6 acres) and Cabernet Franc (0.5 hectare or 1.3 acres). The tightly spaced rows are approximately 4 feet apart with 3 feet between vines, resulting in 8,649 to 9,884 vines per hectare (3,500 to 4,000 vines per acre). Row orientation is northwest to southeast. The vines are trained using a modified Guyot system. A drip system provides irrigation from a reservoir on the estate. The reddish-orange alluvial soil on the Prelius estate, rich in sand and gravel, is the result of centuries of glacial melting, changing river directions, floods and high winds. These natural acts have delivered sandstone from the nearby maritime hills, which has mixed with the deep, loose sand of the coastline to create well-draining soil. Due to the tight spacing of the rows, all pruning is completed by hand. While pruning, the vineyard staff walks the vineyards pushing a steel lorry in which they burn clippings. Once burned, the ash is returned to the ground through small holes in the lorry, providing nutrients to the soil. Vermentino grapes and a small portion of red grapes, which will be used for the estate’s signature blend, CastelPrile, are harvested by hand. 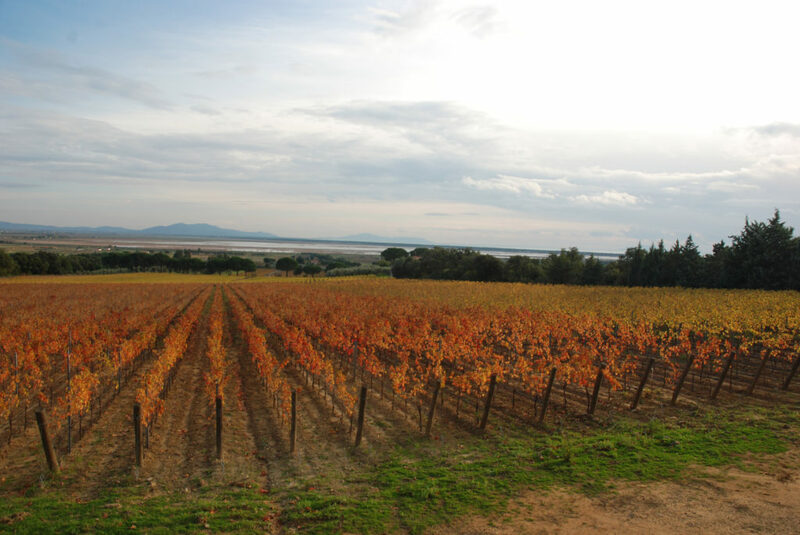 The remaining red grapes are harvested using a Bobard tractor, which allows the grapes to be harvested quickly — the heat of the Maremma can push a grape at its peak ripeness to overripe in a single day. Prelius practices organic farming certified by the EU. To offset CO2 emissions at the winery, Prelius works with LifeGate, a global organization which equalizes the CO2 emissions by replanting forests in Madagascar. Prelius received from LifeGate the “Impatto Zero,” or “Zero Impact,” certification which is recognized by the EU. People are always the foundation for any success story. So it’s no surprise that what lends Prelius its strength is the Stianti Mascheroni family. Leaders in Tuscany’s organic viticultural movement, the family revitalized the village of Volpaia in the heart of Chianti Classico near Radda in Chianti. An avid sailor, Carlo had long spent time on the coast of the Maremma and more recently began to search for a retirement home on its idyllic seashore. Instead, an offer to look at a property with a vineyard was proposed. The family arrived on a clear, sunny September day in 2005 and its fate was sealed. Two years later, Prelius was established. Three decades earlier, Giovannella and Carlo received Volpaia as a wedding gift from the bride’s father. History repeated itself when Carlo and Giovannella Stianti Mascheroni presented Prelius to their daughter, Federica Mascheroni Stianti. With an arts education, Federica had pursued a career in a contemporary art gallery as a painting restorer (she has recently completed the restoration of the important Temper on panel at the Basilica di San Leonardo in Florence), but always remained close to the family’s activities at Volpaia. In more recent years, she had begun to cultivate an interest in agricultural pursuits. 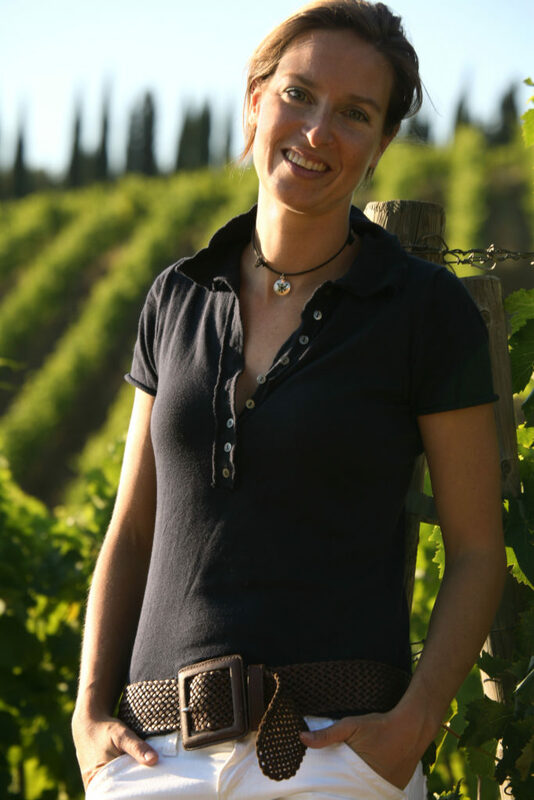 Federica will manage the Prelius estate with the assistance of Lorenzo Regoli, vineyard manager and first resident winemaker at Castello di Volpaia since 2000. Consulting winemaker Riccardo Cotarella will bring technical innovation, new ideas, and suggestions during the final blending process to Prelius, as he has to Volpaia since 2001. The Prelius estate makes three wines: Vermentino, Cabernet Sauvignon and CastelPrile. The Vermentino offers fresh pineapple and apple flavors with floral aromas. A late-ripening, aromatic white grape variety, Vermentino originated in Spain and flourishes in seaside conditions where a mix of sunshine and breezes result in balanced acidity with tropical fruit aromas and flavors. The Cabernet Sauvignon is a rich, yet elegant wine with beautiful tannins and a long, seamless finish. Intended for drinking young, it is aged for nine to 10 months in large French oak casks and then in the bottle for approximately three months. In 2010, Prelius will release its flagship wine, CastelPrile, a blend of Cabernet Franc and Cabernet Sauvignon. The Prelius label reflects the fluid nature of a coastal lake which was once where the vineyards of the Maremma region in Tuscany are today. As the area has evolved, it has established itself as an excellent location for viticulture and winemaking. The Prelius vineyards are located on a hilltop along what was once the shore of the ancient lake, three kilometers (nearly two miles) from the Tyrrhenian Sea. The winery has received high-profile recognition for its contemporary label design, including a “Gold Label” award from Vinitaly’s International Packaging Competition and a “Red Dot” award by the Design Zentrum Nordrhein Westfalen in Essen, Germany. 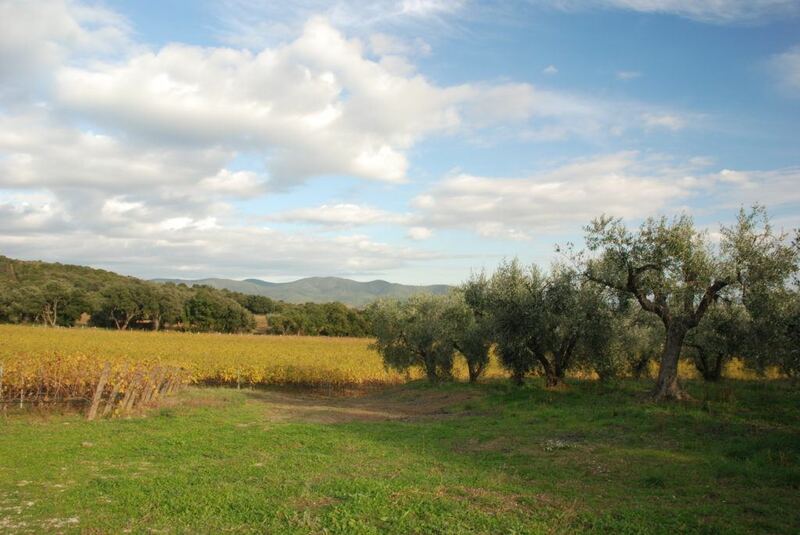 The ancient Maremma region has long been valued for its natural resources. Among its historic attractions was a coastal lake originally called Prelius. The Etruscans relied on it as a commercial resource, farming it for fish and salt. Later, the Romans moved into the area and they too used the lake for their livelihood. 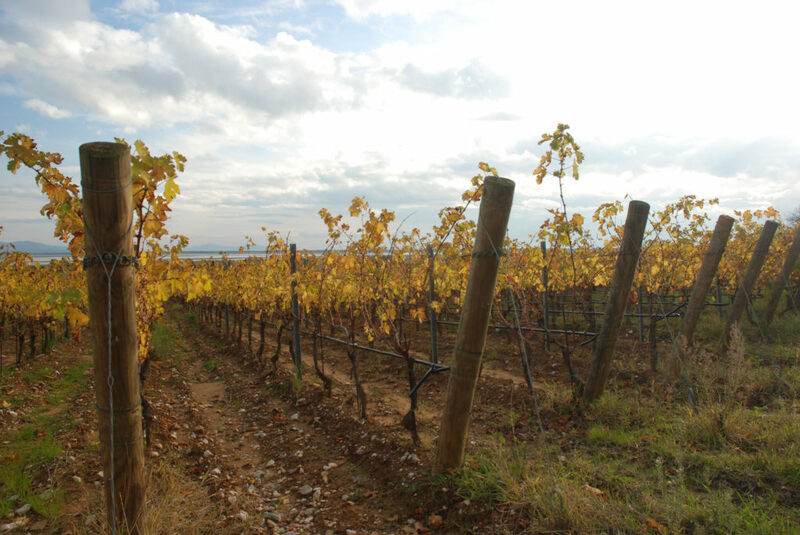 Two to three centuries after the fall of the Roman Empire, an order of Benedictines (as often happens in successful wine stories) began cultivating crops, including grapes, along the shores of Prelius around 800 A.D. The coastal lake then reached from the Argentario peninsula to Castiglione della Pescaia, separated from the sea by a sandy strip that is now a marvelous thicket of pine trees. Eventually, the lake grew swamp-like and in the early 1700s, the Grand Dukedom of Tuscany began the process of draining the lake. After starts and stops over the next two centuries, the lake was drained so the land could be used for agricultural purposes. Today, only a small portion of the lake exists and is part of a national park that serves as a home for many migratory birds. On its shores, only lore and a few ancient walls remain of five fortresses built during the Iron Ages to protect the area from sea invasions, including Castellaccio di Prile, which borders the Prelius estate and the national park. In place of the castles are verdant vineyards, offering the region another valuable resource as vital as the lake and castles once were.